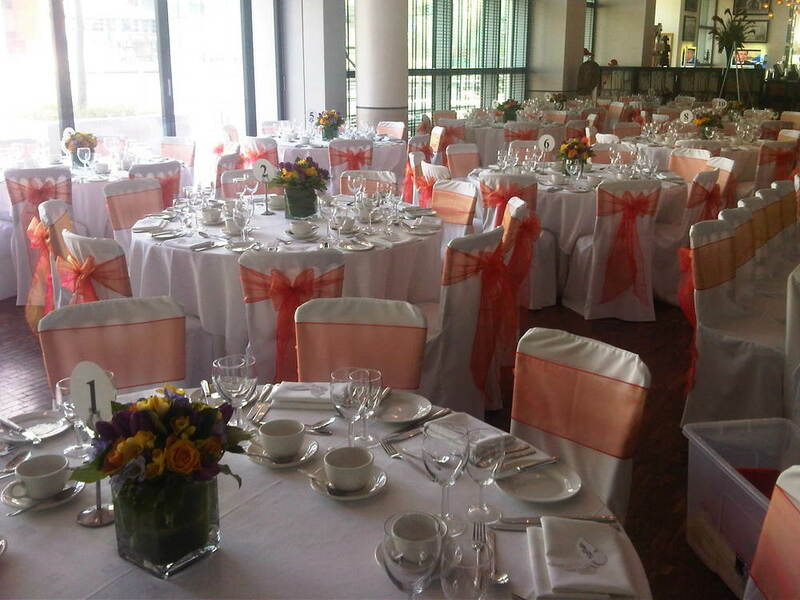 Our beautiful chairs covers and coloured sashes, will transform your venue into the perfect setting for your wedding. We can help to create a breath-taking first impression for your guests, combining our covers with stylish finishing touches. Our chairs covers are available to hire in various sizes, which fit standard banqueting or regular marquee chairs commonly found in hotels, banqueting halls and restaurants. Manufactured to a very high standard and  made from 100% polyester material in white, ivory and black, you can be sure of quality. All chair covers hired, are cleaned, ironed and steamed  ready for  your event. We also stock a variety of different colour organza sashes for you to choose from, which can be tied in with our finishing touches on the back of the chairs - such as single flowers, small bunch of flowers, buckles, brooches and feathers. If you can't find the colour that you're looking for on our website, please call us.